¨The most important scenario¨, according to the Joint Investigation Team´s call-for-witnesses: the ¨track-a-trail¨ narrative. It seems pro-Kiev investigators and crowdsourcers choose to suffer from a ¨tunnelvision¨. Actually, it is really not that hard to come up with a completely different story regarding their 17th July ¨track-a-trail¨ narrative, based on the same evidence they are using to blame the separatists for downing MH17. Until this day I still support the idea the Buk track-a-trail evidence through the Donbass is a narrative that raises a lot of red flags. Nonetheless, because this alleged evidence is there, we have to deal with it one way or the other. One could, for example, suppose the images and videos have all been faked, as Sergey Mastepanov proved they could have been in studies in which he remade the existing visual evidence of the Buk transport with his own hands (see here and here). Another way to use the imagery and supporting evidence available to attack the weakness of the standing narrative is by thinking about alternative scenarios in which these pieces of the puzzle also could fit, although telling another story. I tried to do this in this blogpost from May 2015 by assuming that – although the photos and videos of the Buk transport were real (for an important part) – they were not made on the day of the shooting nor showed the murder Buk. With this method I tried to show foremost how organizations like Bellingcat work. They don’t evaluate the information, as they work from cherry picking unclear, unspecified, undated information from unknown sources that seems suitable to build a desired narrative around. However, more visual “evidence” of the trail surfaced when time passed by, always solving an important question about the trail. The Makeevka satellite imagery supported the Makeevka video of a Buk transport (both released in the beginning of May 2016, 22 months after the crash). These two new pieces of evidence (though not included in an animation the JIT showed of the alleged Buk trail) bolstered the meager evidence of the start of the 17.7 trail in Donetsk. The new Torez video, released by the Dutch police after the 28.9.2016 JIT presser, showed the important right side of the Buk, with clearer visibility than all other imagery before, ready to be used in a matching process to link a Russian delivered Buk to the alleged Buk that was responsable for downing MH17. Anyway, somehow an alternative scenario has to deal with all this. Also other information was made available, e.g. by reports and website from which could be derived (in general terms) what had happened to the ATO Buk units from air-force bases in contested area and which Buk could have been used by rebels to move around the Donbass to account fo the imagery published. At the bottom of this article there is an update in which I will test the hypothesis brought here, with more information about the ATO Buks whereabouts and possible candidates that could have been trailed through the Donbass earlier than July 17th. At this moment the ¨track-a-trail theory¨ (=the theory which states a Russian crew dragged a Buk system on a Volvo truck through rebel controlled territory to Snizhne to shoot down MH17 by mistake) has been appointed by the Joint Investigation Team as ¨most important scenario¨ regarding the origins of the MH17 disaster. This theory is supported by a trail of photos, videos and eyewitness accounts published at social media, allegedly showing the transport of a Buk installation to a launch site and back over the Russian border. Dutch state television NOS promotes Joint Investigation Team video in which is called for witnesses and the “track-a-trail theory” is depicted as being the “most important scenario” they are investigating. In this article I want to propose a scenario of an alternative trail pivoting on the idea rebels transported another BUK on another day. They could have been followed by SBU agents in the field and from positions in ¨safe houses¨ along the road, taking pics and vids. When MH17 was downed this stuff could be used in a very convenient way. One of the most remarkable things about the first pieces of imagery and sightings building up the Buk trail is not only that they arrived for the most part through conduits of trustworthy pro-Kiev relays/reconnaissance volunteers or the SBU and its spies, but also that geolocation efforts were made simple because clear information was added ready to be picked up. The Zuhres video was posted by the original videomaker, pro-Kiev nationalist Andrey Andryushin, with exact coordinates. The Luhansk video was first set at Krasnodon in a tweet by minister for the Interior, Arsen Avakov, but in replies he revised it himself. First he located the video in Luhansk mentioning there also was GPS information, then later he also provided exact coordinates. (Actually the geolocation was done a day before by Ukraine-at-war. At least, this he wrote. Though Paris Match had said it was taken in Snizhne, Ukraine-at-war got another idea. Founded on the existence of trolly wires and someone who jumped in a car and drove from Donetsk to Torez, Ukraine-at-war managed to get the exact location). With these clues a simple geolocation effort was executed by someone from the same investigative network as Bellingcat. The photo of the Buk in Torez only was accompanied with the information it was driving from Torez to Snizhne, which would allude to a site on the N21 highway/Lenin street. It was not hard for Bellingcat’s Aric Toler to get the exact location on this main Torez-Snizhne connecting road by picking dashcam videos of cars moving on Lenin Street. Geolocation of the Snizhne T0522 Buk video was spurred by Eliot Higgins, who promised his twitter followers a gold star for clues to get the actual site from where it was taken. In a blogpost he explained it was a piece-of-cake to come up with the exact location after his “crowdsourcing” efforts were followed up with clear leads. Higgins tweeted the results of geolocation already on 21:32 EEST (17 July), only 23 minutes after he had tweeted he was in possession of this video. And this was only some 40 minutes after it was first posted on an obscure Vkontakte portal. So within the hour the video was posted AND geolocated by trustworthy third party experts! Strangely enough, InfoResistance, a Kievite propaganda channel, issued the exact same coordinates of the Buk location in this video to account for an escape of the murderweapon in a column over the border by Marinovka at midnight. However, this story reached a dead end soon, after the publication of the Luhansk video by Avakov, leaving question marks about the original meaning of this alternative Buk flight story. Coordinates of an alleged Buk escape at midnight posted by InfoResistance (0:32 AM, 18 July), exactly matching the coordinates of the Snizhne T0522 Buk video. Also Ukrainian official Anton Gerashchenko posted the information and coordinates, adding to it the Buk convoy was only 10 km. away from the Russian border. See also my blogpost “Lies, disinformation and ever changing stories: The Ukrainians”. The photo of an alleged Buk launch plume, tweeted by WowihaY at 19:23 local time, also was posted by Ukrainian official Anton Gerashchenko. The advisor of Avakov posted the plume at 20:45 local time on Facebook and did not forget to give clear leads for geolocation. According to him – as he obviously had been in contact with @WowihaY and/or photographer @rescuero – the photo was taken from a building in Microrayon 3 in Torez, a place not difficult to find. This info was ready to be used for a “first line” to conduct a geolocation effort with. As a matter of fact renowned blogger Ukraine-at-war performed the task as he came up with the result in a 21 July blogpost, a result now even officially recognized by the JIT. Even @WowihaY himself immediately had spurred himself to geolocate the exact launch site, which he finished during the early night by using an unknown witness that could perform the important task of a “second line”. In the evening of the 18th he tweeted he even had found a third corroborating witness. WowihaY midnight geolocation. Its not clear if the origin of the second line matches the actual whereabouts of the unknown witness. He/she may also have resided closer to the alleged plume site on this line. Anyway, geolocation was secured by Ukraine-at-war, like geolocation of the other imagery also was established without much difficulty. This way the trail was set on track, using carefully published information. The unique truck with low-loader, carrying the BUK to its destiny, pops up four times in the track-a-trail theory. Immediately it becomes clear in none of these cases an original date is verifiable. SBU (Ukrainian secret service) Youtube video of a fleeing BUK “missing one missile” made in Luhansk: according to an unverifiable and questionable statement made by the SBU, timed at 4:50 AM at the 18th of July. So at this day a lot more information purportedly supporting the track-a-trail narrative has surfaced, so there is a lot more available – or, to put it otherwise, to be reckoned with – than 1,5 years ago, when I wrote this alternative story. I.e., another video came up, 22 months after the crash, which allegedly showed the Buk transport driving through Makeevka near Donetsk, a video supported by publication of the only satellite imagery of the transport available. This satellite image, first issued by private intelligence firm Stratfor a day after Bellingcat disseminated the Makeevka video to the larger audience, showed the Buk transport almost at the same time and the same site, the Avtotransportna street in Makeevka. The JIT made also available two more videos after their 28.9.2016 presser, one from which the Paris Match stills had been extracted and one showing a heavily edited video of a Buk transport going through Torez (this last one was inaccessible shortly after). Of course, these show confirmation of already publicly known evidence, but nonetheless especially the Torez video had some qualities to take notice of. The Paris Match video shows the same problems Micha Kobs brought forward – the time issue, the issue of the incorrect shadows and the issue of perspective. Buk vehicle side-skirt comparison, the technique Bellingcat used to show this Buk matched a Buk from the Russian Kursk brigade, would entail constructing a “pixel salat”, as Kobs dubbed it. The above mentioned issues and other features resulting from the bad quality of this footage render the video useless for forensic comparison with known Buks. The new Torez video at least showed itself consistent with the Torez photo, that is, obviously both displayed the same Buk. Actually, even the flaps of the netting did not show any movement by the wind along the way of the transport through Torez (see image below). Left: Buk on JIT released Torez video. Right: Buk on Torez photo, disseminated in the evening of July 17th, 2014. According to weatherforecasts the wind blew with 5 Beaufort through Torez, but did not manage to displace the foldings of the netting (yellow circle). Interestingly, an implicit confession was made by a leader of the ultra right-wing militia “Tornado”, a group connected to minister for the Interior Arsen Avakov, implicated in criminal actions like kidnapping and torture. According to this source men from Tornado had taken the imagery of the Buk in Torez. So this would confirm the initial assessment that the way the Torez Buk photo was captured, possibly was the result of a special surveillance operation. More important than source, the heavy edited video shows a strange aspect, raising some doubts about its veracity. The Jeep UAZ, a feature of the transport used to verify, seems to drive with the door open. One could imagine this part of the video might have been founded on an animated photo of a Jeep standing idle. Then maybe the rest was too. 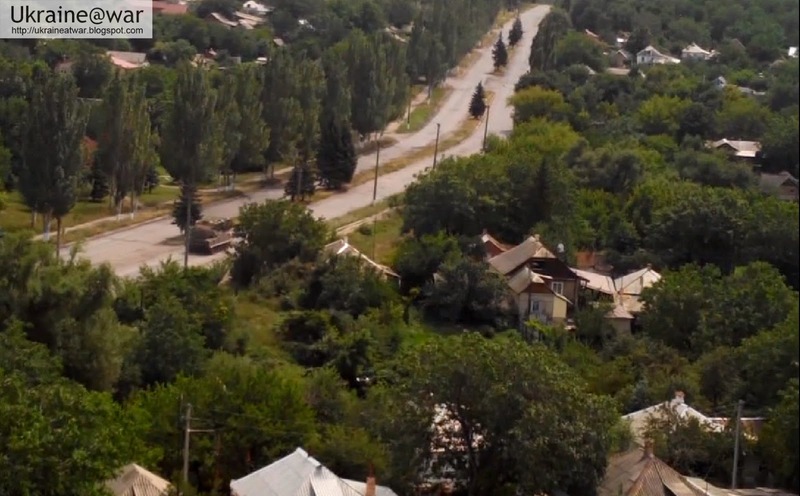 Still of the heavily edited video of the Buk transport through Torez, published by the JIT. The Jeep UAZ is driving with its door open. Or isn’t it driving at all and do we have to assume some picture of this vehicle standing idle was used to make an animation? Of course, even now the date of capture is far from certain. Furthermore, if the video is genuine and captured by a special op. team, at least the question is raised how long the Ukrainians knew of the Buk presence in the DPR and why they had not done anything against it. Finally, from some visual evidence metadate became available. Though the maker of the Zuhres video stated in front of the cameras of “MH17 Inquiry” he would have made the video on the 5th of July, the metadata disseminated showed the exact same time and date as were tweeted: 17 July, 11:40 local time. It was a big mystery why the convinced pro-Kiev infowarrior @3Andryu aka @m_a_s_h_ua would switch sides all of a sudden and came up with another date. Questions I asked the makers of the video did not provide any more information to unravel this. More importantly, the weather forecasts of both dates – 5 and 17 July – don’t match the actual wind direction on the footage as seen by Ole (a southern instead of a north-eastern direction). Weather forecast Zuhres 5 July: clouds with now and then sunshine, but north-eastern wind at 4 Bft. The wind on the 17th was forecasted as eastern, see below. The actual wind on the Zuhres video seemed southern. Summarizing, there is still a lot of doubt about the day at which the Zuhres video was captured (as the wind only matches forecasts of 30.6, 11.7 and 14.7 but not 17.7 or 5.7); About the veracity of the Donetsk movie and stills (was the Buk digitally inserted? ); And about the actual day the Torez footage was taken. 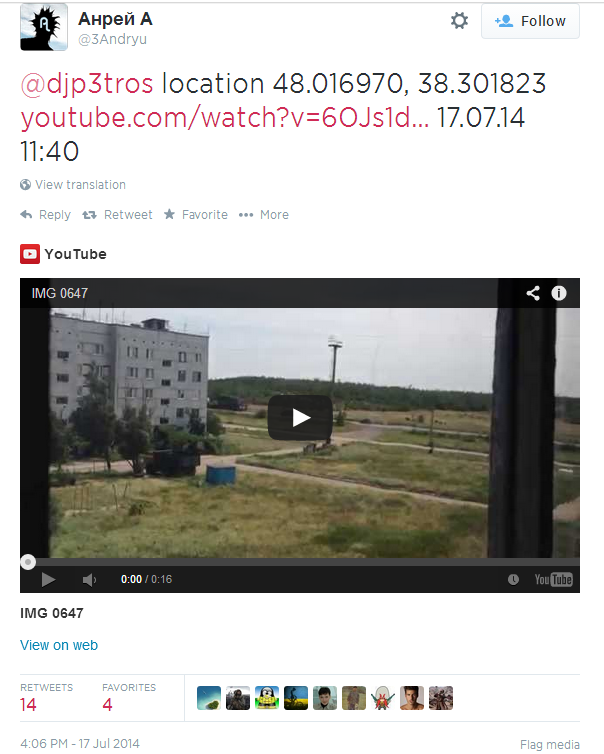 Of course, also of the Donetsk video time of capture surfaced after the JIT published it, as Aric Toler tweeted. It would have been filmed on July 17 at 10:23 EEST, which, by the way, is not supported by the shadow-casting analysis Micha Kobs made based on the two extracted stills (11:05 local time). Time and date are still an issue. Because also the new picture of the alleged launch plume showed some remarkable qualities, matters stayed more or less the same. This new plume was triangulated with “the impossible launch site”, as Kobs calculated , founded on the first launch plume photos. And logic provides us with the conclusion that if one plume matches an impossible launch site, then there is also something wrong with its matching twin (See also here). So actually, seen this way things have not changed much since May 2015. Donetsk militia seized the military defense unit A-1402. Point defense is a division of missile troops which is equipped with the self-propelled anti-aircraft missile systems “Buk”. This is the second unit of the Air Force which passed under the control of militias in recent days. One of them surrendered voluntarily, with the second there were many hours of fighting, according to RIA “Novosti”. Other sources contested. In October 2014 the German secret service BND stated in the German parliament they had clues which would indicate the rebels seized a BUK complex from army base A-1402. Also The Interpreter Magazine, owned by Putin foe Khodorkovsky, used the news as an opportunity to put a ¨smoking gun¨ in the hands of the rebels, after the MH17 crash had happened (¨Evidence of separatist possession of BUK system before downing MH17¨, 2014/7/27). In fact, before Bellingcat issued its report blaming the Russians directly for handing over a deadly weapon, in november 2014, the scenario of the seized BUK was paramount. Now that has been established the rebels may have had possession of a (broken) BUK from the moment they had raided Ukrainian army base A-1402, the question arises if they did something with it. It is not likely the separatists actually seized Buk units on air-force base A-1402, as the Buk units from the 1st battalion of the 156th regiment were kept on sister base A-1428, as satellite imagery corroborates. This base probably was still held by ATO troops at the time (see more in Update December 2016 at the bottom of this article). As the sources speak about raiding a second air-force base in short time, they probably allude to air-force base A-0194 Metalist, near Luhansk. At that base 2 TEL reloaders and 1 TELAR Buk had been left behind, so must have fallen in rebel hands. Possibly Dmitrashkovsky and other officials talk about these units as been destroyed and left as junk. If these vehicles really were demolished by ATO troops is unknown. In each case according to the owner of the truck, the unique white Volvo FH-13 with the blue striping and the red low-loader, had been requisitioned by the rebels at the 8th of July . In any logical evaluation the possibility exists the BUK installation could have been moved from/to Luhansk or Russia between the 8th and 16th of July. Or even earlier after the air-force base raids, if the truck was rented legally before the 8th..
One may assume the Ukrainian secret service kept an eye on this BUK, following the transport with an agent in the field and ¨assets¨ from ¨safe houses¨ along the expected route. Probably they made some photos and videos, stuff that appeared to be useful after the MH17 crash. Almost an hour after the disaster a dispatch appeared on a pro-rebel page on Vkontakte (Russian Facebook), in name devoted to the Russian commando leader Strelkov. An AN-26 had been shot down near the mine Progress, the message said based on the perception of citizens in the area of the disaster. People on the other site also got the wrong idea. This deleted message with Strelkov´s name attached to it could be interpreted as evidence the rebels had taken out a civilian plane by mistake. Not only the citizens from Torez and Snizhne initially thought an AN-26 was downed, which were the original sources the ¨Strelkov¨ Vkontakte adiminstrators had used. The rebels and their chief themselves, obviously still clinging to their previously fired weapon, assumed that too when they were targeting the plane. The suggestion that Strelkov was in any way connected to this VK.com site, was fallacious. But it was very expedient. With the speed of light the internet was fed by Ukrainian war dispatch services, pro Kiev activists and the western media pundits with the suggestion it was the commander in chief himself who thought he had shot down an Antonov. Maybe the SBU had anticipated by creating fake evidence, maybe they made it useful when expedient. In each case the trail theory could be set on track. The Zuhres video was uploaded (though only a still from it was used by the SBU and their partners), the video of the lone BUK on the T0522 suth from Snizhne too. It was made sure these videos arrived at Bellingcat and other pro-Kiev channels. The photo of the BUK parked in front of the Stroi Dom market in Torez was planted at a military portal and in a local chat community (¨Overheard in Torez¨, chat soon deleted) and from there on spread via Vkontakte and Euromaydan. The morning after the SBU posted the Luhansk video on its website. The picture below, attached to an alleged tweet from the militia, would suggest the militants of the DPR would have seized a working BUK. Apparently the pic is only an illustration, for as it already surfaced in social media way back in 2011 . Nevertheless, if we assume the message is real and posted like a kind of trophee, it seems to be capturing some of that ¨limited evidence¨ the IISS guy spoke about. Citizen researcher Max van der Werff, who has an extensive blog about the MH17 disaster, made a trip to the region in which the plane crashed, looking for evidence. According to a tweet he spoke to a witness who had a very interesting explanation. This witness, living across the StroiDom Market in Torez where the BUK had been photographed at the crossroads, said (s)he saw the BUK all right, not at the 17th though, but at a previous date. Ukrainian official from the Interior Anton Gerashchenko reported in a facebook message within two hours after the disaster that local citizens in Torez had seen a BUK complex moving ¨from Torez to Snizhne¨. Curiously enough, there are hardly any solid records and reports of the many journalists on the spot in Snizhne, on a day when fierce battles on the front line south of the city were expected. One AP journalist would have seen the BUK, but attempts to get his identity stranded. Witness probably was Dmitry Lovetsky, who took photos for AP in Snizhne that day. Lovetsky does not responds to questions about his possible sighting. Like is the case with the Paris Match pic not even the original journalist source behind this testimony could be disclosed to the public. Anonymous journalism seems like a fine complementary profession to the new astroturf citizen-investigating phenomenon. It is clear the only non-nationalist source, Anna, actually only saw the three tanks the Vostok battalion was moving by Torez towards Marinovka that day. According to the videos available of this transport also an armoured truck with separatists joined this small column. Neither Anna nor WowihaY, who also reported the three tanks at about 13:00 local time in Torez, saw this “Ural”. This situation was also confirmed by a tweet at 13:10 from another infowarrior, Buk sighting tweeter Roman, who only reported 3 tanks. From the Associated Press witness we know he saw 7 tanks in Snizhne. AP freelancer Lovetsky photographed the Oplot tanks, which were on the road in a column of 4, at 14:00 local time at the gas station in Snizhne. Though on none of his photos on the AP databank the Vostok tanks are visible, the 4 Oplot tanks and the 3 from Vostok would make 7. Also in this case the Ural – “the 8th vehicle” – was missing from the entire picture. Though the Ural was seen after Snizhne in the column again, looking at Anna’s account the AP testimony gets some credibility. The reporter could actually have seen 7 tanks, if Vostok just had passed by Lexus Gasstation at the moment Oplot was photographed there and the Ural, the 8th vehicle, somehow lagged behind. Of course, Bellingcat’s credibility is lowered. They depict Anna’s Vostok sighting as if it was a Buk sighting. Apparently for them anything goes. Many things are remarkable about this message. It showed a sighting of at least 15 minutes, from 9 -9:15 AM. Was the transport under surveillance and followed for some time? It showed three accompanying cars closely resembling the ones on the Paris Match video and the Makeevka video, which both came out much later than all other trail imagery. It entailed a stay of about 2 full hours on the Makeevka Highway between Donetsk and Makeevka, from 9 AM until 11:05 AM when it was filmed by the Paris Match “freelancer”. As it says: ¨In the morning it was written…¨ Occupied_Rook could have read the information written in the posting from VK.com group ¨Donetsk is Ukraine!¨, as Bellingcat infered. However, the direction he points to contradicts this. The Vk.com posting mentioned the transport in the direction of Donetsk, Occupied_Rook says “in the direction of Makeevka”. Both discribe the same crossroads, but apparently the transport was parked at the other side of the road. So was there another written account? Then why didn’t this WowihaY friend point Bellingcat to this source? Its my personal impression from all this information may have been fed to a few trustworthy sources, for example through a telephone network of informants pro-Kiev locals maintained (as WowihaY shows screenshots from this on his twitter timeline on several occasions as well).This might explain why probably all postings showed second-hand accounts disseminated by pro-Kievites.This way “sightings” were constructed, sightings that may have depicted events that did not exist in reality. By the way, Occupied_Rook alludes to Buk use about ¾ hrs after the crash, tweeting: ¨Fits a Buk. I think it [the plane] flew over 4000 meters¨. Rumors this tweeter had picked up about the presence of a Buk in Donetsk at the crossroads of Ilycha Avenue and Shaktostrotelei Avenue, led after the crash of MH17 to a quick conclusion a Buk had been used to down the plane. Even before Ukrainian officials issued accusations and pointed their finger to Putin’s missile. This shows how sensitive people are for suggestions possibly planted by spreading rumours. @WowihaY, connected to much of the trail evidence from the Torez/Snizhne area, also seemed to know about the Makeevka video, issued on the one-time used Olifirenko youtube channel at the same day of the BBC documentary in which he was given air-time. 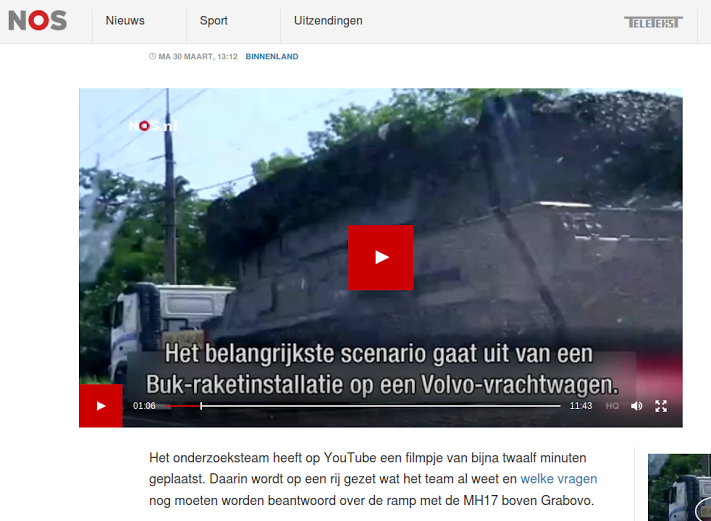 After the JIT/Dutch police released the video of the Buk transport in Torez, he also might have pointed to this one. In that case it would of course be very interesting to know how he got the info if this video was taken in a secret operation by spies from the Tornado militia. As a matter of fact only on July 22nd Bellingcat seemed to have been made aware of this video. At this date @3Andryu posted his video for the second time to blogger Ukraine-at-war (@djp3tros, now @Putin@war), but with another handle: @m_a_s_h_ua. Ukraine-at-war says he had dismissed the video, though in fact he had used a still from it in a 17 July dated blogpost. 22 July, Zuhres video maker Andrey Andryushin again tries to get attention of Dajey Petros aka Ukraine-at-war with another twitter handle as Petros seems to dismiss the video. Actually in a 17 July dated blogpost he already published a still from this video, probably taken over from nationalist propaganda channel InfoResistance, tied to Ukrainian politician Dmitry Tymchuk. Another possibility is he got the stills from the SBU (that showed the same ones on their own website) and later sourced them to InfoResistance. As a matter of fact the blogpost in which Petros published the stills was from 17 July whereas InfoResistance only posted them on their website on the 18th. This also would suggest there was direct contact between Andryushin/@3Andryu and the SBU and his attempts to get Petros involved was to inflict social media dissemination. This still, showing truck with Buk, was accompanied with two other stills showing two vehicles of the Vostok convoy at the same site, a convoy that actually was on the road at midday on the 17th. This way it was suggested “a big terrorist convoy” with Buk had been on its way to Snizhne, a story proven false by various videos made from the convoy. Part of the same conversation on July 22nd, after Eliot Higgins was made aware of the Zuhres video. Ukraine-at-war seemed to cave in after Higgins told him the video fit the timeline. In fact, Petros already had published a still of the same video some days before. I tried to date this video in a blogpost from July 2016. It seemed the video, if not faked, could have been made on 15, 16 or 17 July. See here. Fortunately the mysterious person made sure Eliot Higgins could download the evidence. Within the minutes the video was online on YouTube it received so many clicks it reached the daily top thirty, which may have got the attention of Bellingcat whisperers. The Snizhne T0522 Buk video was first posted by the Vkontakte account of Vita V., who also lived in the apartment from where the video had been made, as was confirmed by investigation on site by citizen-investigator Max van der Werff. She posted the original shortly before 20:33 local time in the local Vkontakte group “Overheard in Snizhne”. It was funneled a.o. to Euromaydan, who posted the original on a website opened for the purpose to display the trail. They announced existence of the video at 21:26 local time, about an hour after it was posted first on an obscure local Vkontakte portal. Then they posted their own re-upload at 21:44 local time, from which we might conclude the original apparently already had been erased by then. Eliot Higgins even posted the original video earlier. In a tweet at 21:13 he asked his public for information about the location (This is the way Bellingcat usually “geolocates”. They first go from local information and then confirm this information). Higgins then re-uploaded his own version at 21:41, 3 minutes before Euromaydan. The impression remains there was some kind of coordination involved here. Apparently the poster made very sure the video was picked up by the right parties. According to the Amnesty International Youtube DataViewer, which guarantees the right metadata of an uploaded video, three copies of the deleted lone BUK video were instantly re-uploaded within minutes by Eliot Higgins, Euromaydan and Torez.info . Torez.info is a local website co-administrated by Vladimir Djukov, alias @WowihaY, the same person of two witness accounts and the first to tweet the incredible important picture of the alleged plume of a BUK launch. Obviously the source knew which way to go to get the right attention. The Luhansk vid doesn´t smell any better. Journalist Vincent Verweij of KRO Brandpunt (Dutch news show), and others, casted doubts about the SBU Luhansk video of the fleeing truck missing one BUK missile months ago. The road the truck had been geolocated on probably wasn´t even under control by rebels on the particular period in time when the plane was downed. 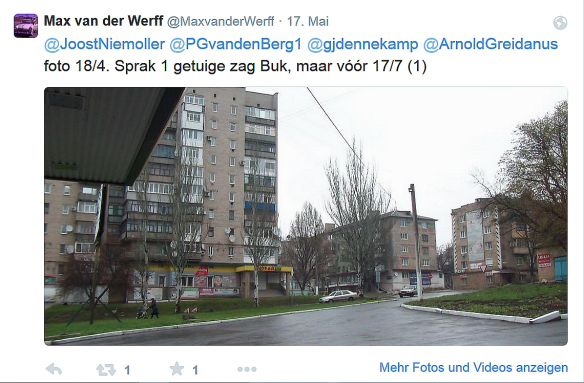 Verweij had access to a map that showed the situation on July 17/18, 2014 in West Luhansk, which was very complicated. Heavy fighting took place in the vicinity of this alleged escape route, so this hardly could be a reasonable way to flee the country. That would obviously raise serious problems for the track trail theory. First, there wouldn´t be any evidence left of the flight of the transport towards Russia (by the way, neither was there any proof the BUK had been transported to starting point Donetsk the night before for that matter). But also the theory of an alternative BUK trail would arrive a little bit closer to reality again. 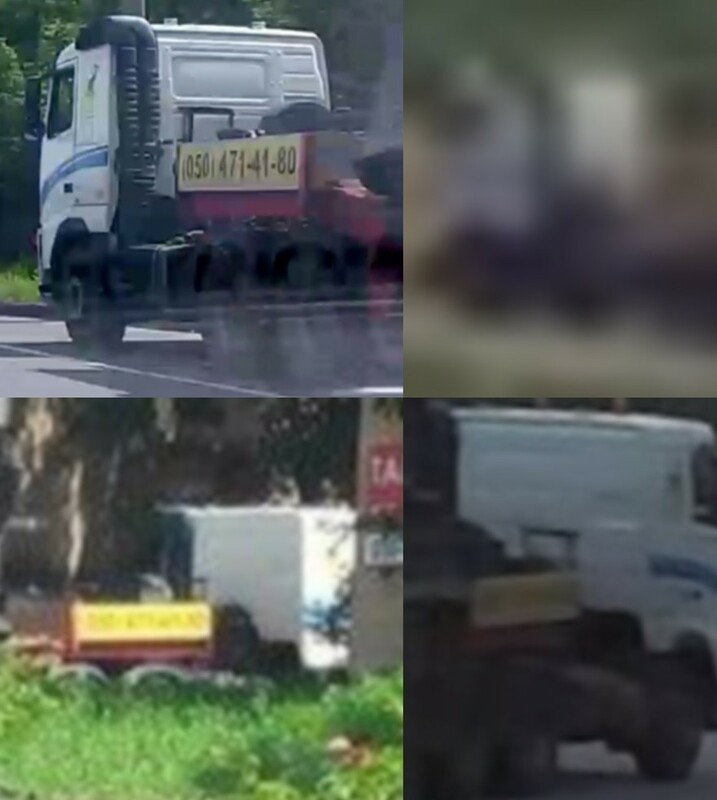 When the SBU Luhansk video of the truck with the unique blue lining had been taken before the early morning of the 18th, then – given that uniqueness – all other stuff could also have been made at an earlier date. This is nothing more than reasoning the same way Bellingcat does: all evidence has to stem from the same day. It has been established “infowarrior” @GirkinGirkin was not the first one to publish this photo. First known posting was on Vkontakte by Vlad Polienko, who was actually in Kiev at the time, so also was not a first hand witness. From whom Polienko got the photo is unknown. As he did not mention Russian speakers, we also don’t know how this information arrived at GirkinGirkin. See also Section I, “Problems of videos and photos” here. Furthermore, it established the working methods Bellingcat holds: they pick up the low hanging fruit from a conduit of infowarriors that knows how to get the info around, not doing in-depth social media research. This information was not attached to the earlier publication found, the one from Vlad Polienko on Vkontakte. How GirkinGirkin had received the info about the location where the photo was made, is unknown. Whether Bellingcat has possession of the original time stamp of this photograph or hasn´t, is unknown to me. [But as the GirkinGirkin pic is not an original, they won’t have] However, in their report about the track-a-trail theory the time of the off-loaded BUK pic has been determined by performing shadowcasting analysis, as was done in other cases in which metadata about the exact timestamp were missing. The date, therefore, still remains open to speculation, until the photographer or Bcat provides verifiable metadata of the photo. For that matter GirkinGirkin himself didn´t respond to a question from a Twitter user to send him the original image (see replies in link above). When I asked Eliot Higgins what he thought of my alternative theory, at first he replied that in his opinion it was ¨not convincing¨. Later he claimed to have done research to any previous material (dated before 17 July), but couldn´t come up with anything. Obviously I tried to question Dempsey, the IISS think-tank member, what he thought of Higgins’ statement, but it is still awfully quiet from the United States. Maybe someone would have to get his hands on the scripts, bots, queries and results of those crowdsourcing searches performed by Bellingcat or IISS. But that will probably be a tough job (so much for open source). Facts to test my hypothesis were constructed after studies developed from which the general whereabouts of ATO Buks could be derived. This way could be guessed if and which ATO Buk could have been seized and transported through the Donbass by separatists on a day before the 17th, followed by Ukrainian spies to keep an eye on it – in the meantime collecting visual information. There are not many accounts supporting an earlier transport, if we exclude the known photos and videos. A few people mention it, like in this tweet. On the other hand, nobody ever did an in-depth investigation into this. With these sources we might be able to get knowledge about the possibility of a Buk seized by sepatarists, and if so: which one. Buks belonging to the 1st battalion of the 156th regiment consisted of 6 TELARs (launchers) and 3 TELs (reloaders). Ukrainian disinformation, spread by affiliated western newspaper Daily Mail, initially depicted Buk 121 from air-force base A-1428 Avdeevka as the Russian murder Buk, but obviously the picture displayed showed the Ukrainian army conscript Sergey Paschenko showing off his machine. So four TELARs and 1 TEL were evacuated, i.e. visible on video is BUK 121 on a military transporter with the main convoy, see here. And BUK 122 on a military transporter separated from the convoy, see here. 2 TELs and 2 TELARs were left behind at A-1428. Three of these vehicles were ultimately destructed, but the precise date this would have happened is uncertain. 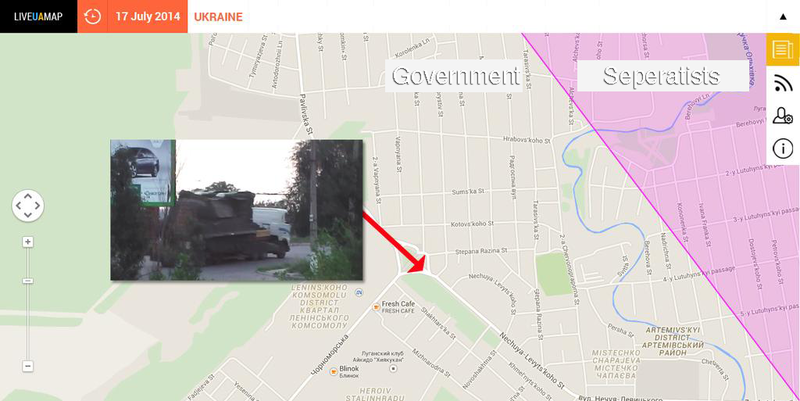 Bellingcat and the SBU claim a Buk already was broken on July the 17th. In fact, the separatists launched an attack at June 21, 2014, on the radar facilities of A-1428 (see note 41 in the Andrew report), but it was not confirmed also the Buk vehicles on the base were targeted. Bellingcat shows pictures of broken Buk 132 from August the 8th, see this report at p. 11-12. Buk 132 broken some date before August 8th. According to imagery on Google Earth the vehicle was used up till summer 2014, notwithstanding its seemingly “rusted” caterpillar belts. According to Russian satellite imagery, timed at 11:32 EEST (or Moscow Time) on 17 July, the vehicle was off-base, possibly to be routed towards Zaroshchenskoye to be in firing range of MH17. The SBU and Bellingcat, after its purchase of Digital Globe 11:08 EEST imagery, claimed the vehicle was right at its spot. (see below). Buk 132, standing on its spot at 17 July, 11:08 EEST. Room for maneuvring is not large. This Buk must have left the base some time between 11:08 and 11:32 (and not have been demolished already to a point it would have been unmovable ) on the 17th to fit in the Russian version of events. However, the broken Buk TELAR 132 on the 8 August photos could have been destroyed by enemy fire, but could also have been made inoperable by other means, perhaps when fear about being overrun by separatists inflicted a state of high alert. Andrew concludes destruction would have been much later than the 21st of June though, as severe shelling of the base itself can only be proven from late summer 2014. After shelling the state of the Buks was far more worse than in August. For pictures, see here and here. Fact is these Buks were positioned at A-1428 no less, and not on A-1402, as the many reports from June the 29th suggested. Article RIA Novosti, dated 29.6.2014, claiming the rebels raided airforce base A-1402 and possibly captured Buk units. It is not likely, according to the above listed sources and inspections of satellite imagery of this base, there were Buks seized at air-force base A-1402, broken or operative. As a matter of fact, also blogger Ukraine-at-war stated A-1428 was not under separatist control and on A-1402 there never were Buks present. Though this may be right, reading this source must always be accompanied with the notion that the agenda pursued is proving the murder Buk could only come from Russia. However, even if destruction took place before July 17th there was still an issue to take note of. TELAR 132 and TELs 113 and 123 were left behind after a March 2014 evacuation, apparently along with one other, not identified TELAR. “These units were clearly active into the summer as they shift positions on the base and their missile launch shoes are rotated”, according to Andrew, p 23. TELAR 132 and also TELs 113 and 133 were the ones destructed, as can be seen on a Vkontakte account and in a video from March 2015. So were was the second TELAR and what had been its designation? Representation of the 2.3.2015 visit of the videomaker after air-force base A-1428 was destroyed by heavy shelling. TEL 123 actually is 133. Courtesy @MH17Report. Deriving the designation of the actual TELAR left behind and not destructed, is not that simple, though the scarce sources available could give more information. Left behind: TELs 113, 133 and TELARs 132 and one other TELAR. Satellite imagery of 2014 shows two TELARs on base A-1428 were probably operative in the months May-June. Air-force base A-1428, Google Earth 30 May 2014 image. The top left side of the motorpool shows 7 vehicles, of which 1 TELAR and 2 TELs. The other TELAR (132) is located south, next to the shed with the blue roof. Air-force base A-1428, 2nd of July Google Earth imagery. A possibility, as Andrew seems to allude to, is that Ukrainian defectors went over to the rebels with this Buk 131. Then it obviously becomes a possible murder weapon too, but without Russian assistance and arrival on July 17th, as the SBU intercepts would prove. Also all kinds of other scenarios are possible – ie. illegal selling to whatever party – unless the Ukrainians give full openness about the post June whereabouts of Buk 131. Evacuation on 19 March 2014: 232 with an unknown TELAR (possibly 231), 212 with an unknown vehicle (possibly TELAR 211 or a TEL), TELAR 222. This might add up to even 5 out of the six present TELARs. Those vehicles were evacuated in March, but their whereabouts after that are unknown. Andrew shows on ps. 25-27 in his report that left behind were two TELARs and 2 of 3 TELs, which eventually were all evacuated by Ukrainians before September the 5th as satellite imagery testifies. However, because these two TELARs show up on Google Earth imagery of the air-force base, three possibilities remain. One TELAR of the five evacuated eventually was returned or it was replaced by a Buk from another battalion or even another regiment. Or – most likely – one of the two vehicles that could not be seen accurately on the video, actually was a TEL. Illustration depicting sightings of ATO Buks from the 3rd battalion, evacuated in March 2014 from air-force base Metalist. Evacuated in March from air-force base Metalist, near Luhansk were TELARs 312, 321, 331 en 332, TEL 323, TAR 301. Andrew claims one TELAR (322) and two TELs (313, 333) were left behind. Supporting his claim TELAR 322 was left behind is a video of a transport of two vehicles, showing TELAR 311 and TEL 323. Buk 311 was evacuated as well. In this article it is admitted that ATO left behind three Buk’s, which they claim were disabled, and that Base A-0194 was overrun by the “terrorists”, and so this was not a location with Ukrainian BUK’s in active deployment. These might have been the captured units ATO had left behind though. On the 16 July there was a message, published by Colonel Cassad, the LNR was in possession of a Buk, combat-ready even. Had it been repaired? Of course, there is also that famous 23 July interview Reuters had with commander of “Battalion Vostok”, Aleksander Khodakovsky. According to the commander the LNR supposedly had Buk units in the Luhansk area. “I knew that a BUK came from Luhansk. At the time I was told that a BUK from Luhansk was coming under the flag of the LNR” (…) “That BUK I know about. I heard about it. I think they sent it back. Because I found out about it at exactly the moment that I found out that this tragedy had taken place. They probably sent it back in order to remove proof of its presence”. So from deduction and verification it is clear the TELAR – the vehicle with the white dome and rotated launch shoe as seen on the 24.5.2015 image below – must be TELAR 322. Google Earth image from 24 May 2014 of Metalist air-force base (48°36’33.38″N 39°13’58.11″E ), top position Buk 322 with TEL 333 standing behind it. Next to TEL 333 another TEL is visibe (313). Buk 333 slightly slanted behind Buk 322 (photo from lost armour). The sloppyness of – and disinterest in – the work Bellingcat performs regarding studying the whereabouts of the Ukrainian Buks can be illustrated by the unspecified publication of the following information. Bellingact published a video showing TELARs 121, 122, 322 and 331 moving around by Ukrainian troops before September 2014, according to this video. It seems to show a mix of 2 battalions, as it displays vehicles from the 1st and 3rd battalion according to the designation of the vehicles. Saliently, in this case 322 would have been spotted after 17 July, which would erase the possibility this Buk was transported by rebels after they seized the Metallist air-force base. (Strangely enough, in the caption of this video Buk 322 is not listed by Bellingcat as spotted). However, the transport is very likely organized by the 223th regiment, originally stationed in Stryi, Lviv Oblast. These are TELARs 122 and 322 from the 223th regiment, as the illustration below makes clear. The vehicles from the 223th regiment show distinct colors and therefore are clearly recognizable. It seems Bellingcat has no interest in investigating this topic thoroughly. Andrew was right Buk 322 of the 156th regiment was left behind, as could be deducted from the knowledge about the designations of the evacuated Buks. Also a photo of this TELAR left abandoned on the Metallist air-force base was dug up. (Original, see here). Buk 322, standing at Metalist air-force base (fence to north-east is visible). Apparently this photo was taken before June 30th, when LNR soldiers had not rotated the Buk launch shoe in alignment with the vehicle yet. The information was tweeted with a tag from August the 24th. and a geolocation. According to Andrew the tweet photo was taken before June 30, by which time the LPR had turned on the Buk and rotated the launch shoe, as is seen on satellite imagery of this date. From Google Earth imagery is known the Buk vehicles were removed from base some date before 8 August, though they were still present on 17 July. Actually this picture fits information from counter-intel chief Nayda in the night of 17 and 18 July the rebels moved a Command Post and three other Buk vehicles to Russia, which says the border obviously was watched very carefully. Of course, in that case, there must have been made video tapes too. “The SBU established that on July 18 about two o’clock in the Luhansk region state border of Ukraine in the direction of the settlement of the North – Verkhnya orikhivka of the Russian Federation, crossed trucks, each of which carried a launcher “Buk”. At the first there were four missiles, meaning it is not used, the second had three missiles,” he said. Later, when the Luhansk video with the famous Buk launcher carrying only three missiles was published, it was allegedly shown this three missile Buk drove alone to the Russian border at 4:50 in the morning. Removed from base after July 17 but before August 8: CP 300, TELs 313, 333 and TELAR 322. However, footage from March 2014 exists which shows Buk 311 also was on the road along with command vehicle CP300. Apparently it was not CP300 that could have been spotted by Naida’s men. As this air-force base was run over by the separatists it is established they could get hold of these left behind vehicles. In fact, a transport of, for example, TELAR 322 could account for the unknown Luhansk video Lysenko was talking about. The rebels possibly moved 322 to Snizhne or Donetsk to have it repaired or something and then transported it back again to Luhansk. This could at least account for the Zuhres video and the Luhansk video and maybe even also for the Makeevka video. The Torez photo and video are more difficult to explain, after the wheel issue was rolled out. In a report that was meant to support the claim the Buk from Paris Match stills was in fact Russian Buk 332 from the Kursk convoy, a comparison of both Buks was made. One surveyed indicator was the wheel configuration of the studied Buks. A Buk can be equiped with two kinds of wheels, a spoked type or the non-spoked, hollow type (see illustration). It is also possible a Buk has both types of wheels attached to the same side. The Kursk Buk apparently had all spoked wheels on its left side, but one hollow wheel – at the second position from the left – at its right side. Not an uncommon configuration, but also not very ubiquitous. Wheel configuration comparison: Torez Buk video (left) and Kursk Buk 332 (right). According to Bellingcat the second wheel of the Torez Buk from the left is hollow. Wheel configuration of some Buk. All spoked, except second wheel on the left, which is of the hollow type. When the Torez video was released, it appeared to show the important right side of the Buk, which maybe had that hollow wheel at that particular site. As all other low resolution Buk imagery was too blurred to say anything solid about any indicator, this was a bigger chance to try matching the Buks by their wheel configuration. To test my hypothesis further I tried to establish what the wheel configuration was the ATO Buks possessed. From the above sources it was clear they almost all seemed to have non-spoked, hollow wheels on both sides. 1. Its unlikely rebels had possession of a Buk, inoperable or not, resulting from seizing air-force base A-1402. What it proves is that pro-separatists outlets had no interest in hiding Buk possession, on the contrary. This casts doubts over the story disseminated by pro-Kiev sources and the AP reporters the Buk tour had to remain secret to account for lack of clear visual evidence. 2. One Buk TELAR of the 1st battalion, which was left behind after evacuation, was not made inoperable nor perished after shellings. Though there is not one single piece of visual evidence available TELAR 131 was the one left behind, it probably was. On July 2nd satellite imagery it seems to be missing from the picture. What has happened to Buk 131? Was it still under ATO control? Or did it fall in other hands, under rebel control or maybe even under control of an extremist Kievite militia? 3. As it is not certain when Buk 132 effectively was destroyed, its whereabouts in the afternoon of the 17th cannot be fully accounted for. Perhaps the rusty caterpillar belts, as seen on the pictures, would impede moving it around, perhaps not. It is not likely, though also not entirely impossible, it was missing from the air-force base at 11:32 local time, as Russian satellite imagery tried to show. However, if the Russian image was taken at Moscow Time, 1 hr has to be deducted. Then Buk 132 must have been off-base before it was captured by Digital Globe GeoEye 1 standing on its location at base. If the Digital Globe image is genuine, then the Russian image almost certainly was forged. 4. One TELAR of Metalist air-force base, designation 322, could account for footage retrieved by the SBU before the 17th, as alluded to in a presser in which National Security advisor Andrey Lysenko stated there already was a video of a Buk transport available on the 17th before it supposedly was captured on the 18th. Maybe it was also filmed on a trip through Donetsk (Paris Match, Makeevka) and Zuhres as well. Matching the Torez imagery to this Buk seems to be more doubtful, as this Torez Buk seems to have spoked wheels and virtually all ATO Buks from the 156th regiment likely had hollow wheels. Regarding this important feature and the sourcing of this material, its imperative the JIT hands over the full video with metadata and source (Tornado?) for public scrutiny. 5. When ATO lost Buks, they may have called in replacements. This would complicate the picture of Buk whereabouts and availability further. For the alternative theory can be said that in this case it is very unlikely an actively deployed replacement Buk under control of ATO troops, i.e. one with spoked wheels as is seen in the 223th regiment and on the Torez footage, had been captured by the separatists to move around the Donbass. On the other hand, when the second TELAR on base A-1428 left behind, actually was a replacement Buk, the whereabouts of TELAR 131 cannot be accounted for. The Amnesty International Youtube Data Viewer proves the deleted video of the lone BUK moving to the alleged launch site was re-uploaded by three trustworthy parties within minutes from each other. In his latest topic “Geolocating MH17 Crash Videos with Checkdesk”, I asked Bellingcat why he needed a photo editing program for if he uses authentic images? Probably he was not that happy about it, it didn’t pass moderation. I would like to draw your attention at this article, which I have experienced myself on the Dutch Wikipedia site about the SU-25. I even think that Kiev reports about the downing of two SU-25’s on the 16th of July 2014 are lies. I think they were shot down at the 17th, according to an eyewitness report of Lev Aleksandrovich Bulatov, which Max van der Werff has interviewed on his investigation trip to Ukraine. At 09:20, a Ukie Su-25 was shot down over Dmitrievka. From Snezhnoye, they are reporting that a second Su-25 was shot down with three shots from a portable anti-aircraft unit. This is the work of anti-airfact personnel of Battalion Oplot. – then why couldn’t the Ukraine close their airspace the moment they saw the convoy? – why are there photos of vehicles that are not on the video? – if it was a convoy of so many vehicles, why are those vehicles not on the other photos of the BUK trail? Working on the convoy thing. We know ¨the BUK should go with Vostok¨, as commander ¨Chmuri¨ tells the driver of the truck on the alleged wiretaps from the morning of the 17th. This tap locks nicely into the message head of ¨Information Resistance¨, Dmitriy Tymchuk, spread on Facebook at 19:19 EEST at the 17th, a few hours after the crash, in which he claimed the murder weapon went in ¨a¨ convoy together with ¨3 tanks, 2 armoured personnel carriers (APC´s), a cargo truck with insurgent and a cargo truck with a mounted large caliber machine gun¨. Ukraine@war (and maybe others) probably was fed with the convoy pics by the SBU, as is Micha´s working hypothesis, and from there on they were spread over the net. Then there was the Oplot convoy. @WowihaY tweets about them too. But this convoy, though according to WowihaY in Torez at the 17th, already stayed in Snizhne at the 16th where they shot down Ukie planes with MANPADs. This is claimed by Strelkov_info that issued at the 16th a briefing by the commander himself about this fact. So in what convoy did the BUK go? As you say, there´s no footage that can place the BUK in a large convoy. In fact, at this moment I assume the agent in the safe house in Zuhres, like you say, waited to take snapshots of the Vostok convoy and on another time and/or date filmed the truck with BUK and two cars too from the same spot. Then they glued it together as if there was one convoy. I got the idea the whole ¨BUK in convoy¨ thing seen by ¨local patriots¨ moving ¨from Torez to Snizhne¨ is a fake ¨meme¨ that has been planted in a few trustworthy news outlets and by some ¨local patriots¨ to construct social media testimonies regarding the BUK trace. But more research is necessary. Obviously they feel pressure now. So they have to fit the story to the facts again, an assignment Bellingcat is working on. They will deliver too. Yesterday Higgins told me on twitter they will come up with a report with new testimonies, including statements and evidence from which can be deducted there were actually THREE transport. So we have Vostok and the Chmuri/¨Motel¨ wiretaps (the driver had to deliver the BUK behind the Motel to get it in the Vostok convoy). We have the possible refusal of the BUK transport to go with Vostok, because apparently they finally decided to go by themselves (or maybe the tapes are frauds). But what will be the third convoy Bellingcat will reveal? hadn’t read the paper of Micha Kobs before, it’s a good summary. Concerning the videos from Zuhres and Shiznhe: If those videos really were made by observers the bad quality is surprising. If the observers were to gather intelligence, one would expect them to take better photos (Aleynykov Style), which help to identify the vehicles, the individual persons, kind of weapons, ammo, what missiles the BUK is fitted with etc. But instead they make low quality handy videos, which make it hard to distinguish what kind of vehicle they show. So if the videos were made by SBU observers the purpose was not to gather intelligence, but to create some seemingly genuine videos which could be posted on internet as if they were made coincidentally by local people. Exactly. Its not ruled out the pics and footage were made by ¨local patriots¨ who were in close contact with the SBU, like @WowihaY clearly was. But they could be official SBU agents too. Yur claim seems plausible. Micha, who´s a filmmaker, also claims for this purpose you don´t come up with high-tech Hollywood material. When geolocated, the pic of the Furshet market in Torez is made from the other side of the street, hiding behind a small building. I always wondered why there weren´t more pics from that spot, why the photographer didn´t make more pics from close by. As always you have to consider other possibilities. If the small BUK transport was there, it must have passed Vostok on the road. Possibly they moved along a short time, when spice4russia sees them both in Shakhtarsk. But, of course, there is no visual evidence for this. is of extreme low quality, the tank is almost not recognizable. Yet Ukraineatwar has a video still with much higher resolution. Can be noted for example in the structures of the roof tiles. Somebody (the producer or Higgins) chose to publish a lower than original resolution of the video (why?). Yet Ukraineatwar was provided with a higher resolution version (by whom and why don’t they publish it?). Again it appears this was produced as useful evidence, the flat the video was taken from seems to be ideal to observe the area and the movements towards saur mogylia. The alleged launch site is 4.5 km away right in front of the flat, the observer who made the video had a first class view to that alleged launch site. If he was interested enough to take the video of that tank driving towards the fights in the south, why didn’t he see and photograph the alleged launch of the BUK? was taken from the same block of flats. The alleged launch site is to the extreme left just slightly outside the field of view of this pic. The road the tankish think was driving down is to the extreme right, the alleged launch site slightly out of the FOV to the right. The observer who took the tank video had a completely unobstructed view to the south (the area where both of the above panoramio images end), so why are there no photos by him of Aleynykovs smoke trail?. Good thinking! Yeah,some time ago when I only knew about the vid uploaded by Brown Moses I wondered how they could tell it was a BUK. To me it was just a tank, a “tankish construction” as I said in the article. I suppose Ukraine@war and @WowihaY are at least reconnaissance volunteers but maybe even with a more formal function. Some say Higgins is going by his contempt for Russians alone, so he is passively fed by the SBU – no questions asked. Others think he is in direct contact with them to play out tactics. Any way, it smells. Maybe you can mail me at hectorreban@gmail.com for your mailadres? To use that driveway only makes sense for the inhabitants of the neighbouring buildings, so the driver of that car should be easy to identify and could be interviewed what day the BUK passed by. Obviously the video was cut such that the car shouldn’t be visible. So now we know with a fair degree of certainty the Luhansk vid has been made on an earlier date and the Zuhres vid too. What do you say about its resolution? It seems to have been withdrawn early. So, no need to use the recorded data of Donetzk airport. 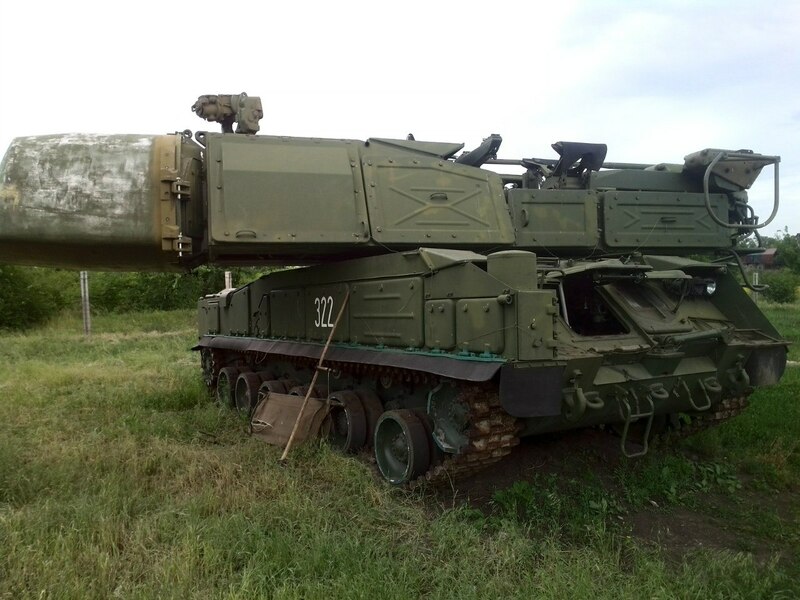 After Military Unit A-1402 was taken over by NAF on June 29, a number of photos of BUK launchers were published online. I did a Google image search to see if any of the photos were new. I found out all the photos were old archive photos. Thanks for your reply, Petri. As you say evidence of the seized 29 June BUK is virtually absent, if one disregards the possibility the footage in the Bellingcat track-a-trail could involve this BUK. As I wrote the leading pro-Kiev narrative is now this story was disseminated to create a cover for the Russians to deliver a BUK themselves. Hence, to boost credibility, no military truck with low-loader was handed over and no TEL reload vehicle, because that could blow the Russian cover-up story. Main argument against this scenario is why the Russians would hand over a highly valued war asset without any logistic back-up. The BUK could fire its 4 missiles and then end up at the junk yard for military vehicles in Lenin Street, Snizhne (right beside the 15th July bombing site for that matter). The dissident story is the Ukrainians stepped in to corroborate this story, as I write in the article, but in fact to create the illusion the rebels took hold of a BUK, which showed to be conveniently when MH17 was downed. The Ukrainians issued contradicting statements according to political need. Officially there was no BUK, but evenso the rumour was spread, also by officials. We have to remember this scenario was leading until the Bellingcat Kursk convoy scenario – a BUK handed over by the Russians in the morning of the 17th – became paramount. Sergey Mastepanov, mentioned in the notes, supports this line of thought: The Ukrainians covered their false flag by instating rumours about BUK possession of the rebels. My hunch is the rebels only had possession of one or more BUK platforms some days before the 17th. It is certain the truck, lowloader and accompanying cars of the small convoy were in their possession. That way the footage, or parts of it, with the unique truck could have been made within days before the 17th. The Zuhres vid is consistent with weather on the 14th and the 11th (and also on the 30th of June, but not on any other day in that period of time).